Chuck Baldwin wrote an excellent article on the heroes of the Alamo and how they were so different to the jelly-kneed politicians and liberals of today. 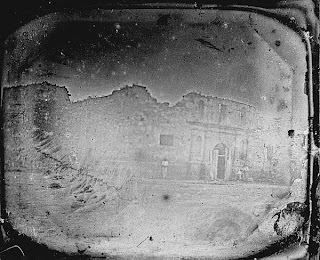 "During this week back in 1836, the Alamo fell. For more than 13 days, 186 brave and determined patriots withstood Santa Anna's seasoned army of over 4,000 troops. To a man, the defenders of that mission fort knew they would never leave those ramparts alive. They had several opportunities to leave and live. Yet, they chose to fight and die. How foolish they must look to this generation of spoiled Americans. "It is difficult to recall that stouthearted men such as Davy Crockett (a nationally known frontiersman and former Congressman), Will Travis (only 23 years old with a little baby at home), and Jim Bowie (a wealthy landowner with properties on both sides of the Rio Grande) really existed. These were real men with real dreams and real desires. Real blood flowed through their veins. They loved their families and enjoyed life as much as any of us. There was something different about them, however. They possessed a commitment to liberty that transcended personal safety and comfort."